OK ladies it's time to ditch the idea that wedding dresses need to white and meringue, like seriously who sets these rules anyway. Many women are now opting for beautiful coloured gowns and we are so, so on board. So if you're looking for something a little different on your big day, here's all the inspiration you need. With more and more women bucking tradition and going for coloured wedding dresses, it looks like the classic white gown might be going out of fashion. What's great about coloured dresses is that it allows you to have more options for your big day and it means you can add your own personality to the wedding day. It also means you can wear the dress again, which is great considering it will cost you an arm and a leg. Here's 50 of the best ideas to get you going. Blush, pale pink, is a great colour to go for if you don't want to stir too fair from tradition.The colour is tasteful, and is a great wedding look, even if you're not a fan of pink. The softness of the colours gives a dreamy and romantic feel which is just right for weddings. 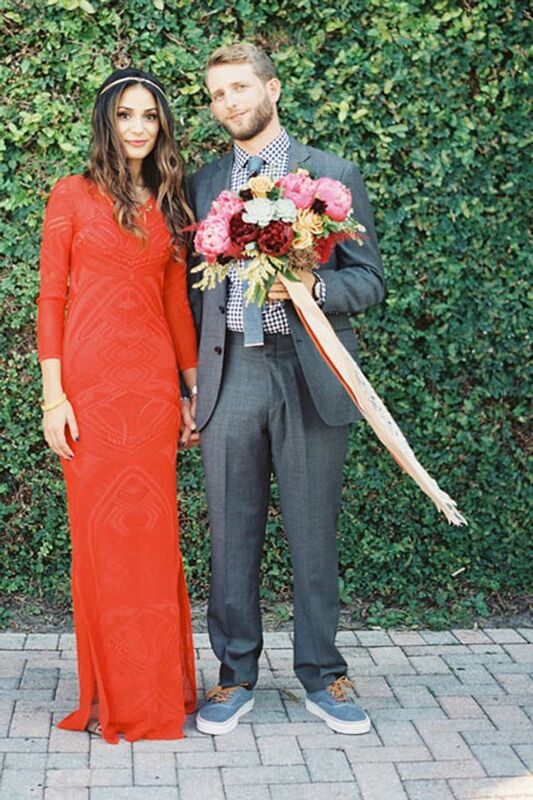 Red is the colour of love after all, so it makes sense to choose this shade for your big day. It's a bold colour that's sure to make you stand out from the crowd. The colour works best for winter weddings, and if you're not sure about wearing a full red dress, why not add touches of red on the dress. The easiest way to stand out on your wedding day is to sparkle, and when we say sparkle, we're not just talking about your ring, we're talking sparkle from head-to-toe. 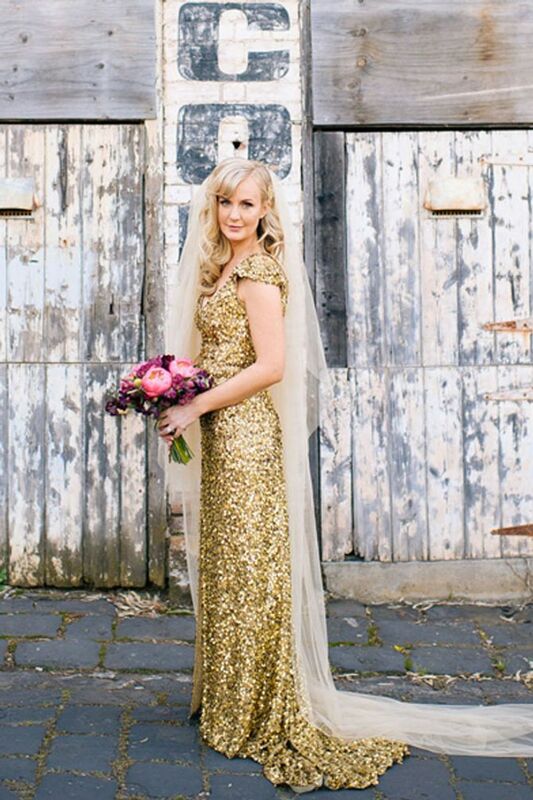 Golds and sparkles are commonly worn by royalty but heck it's your wedding day, we're sure that gives you princess status. 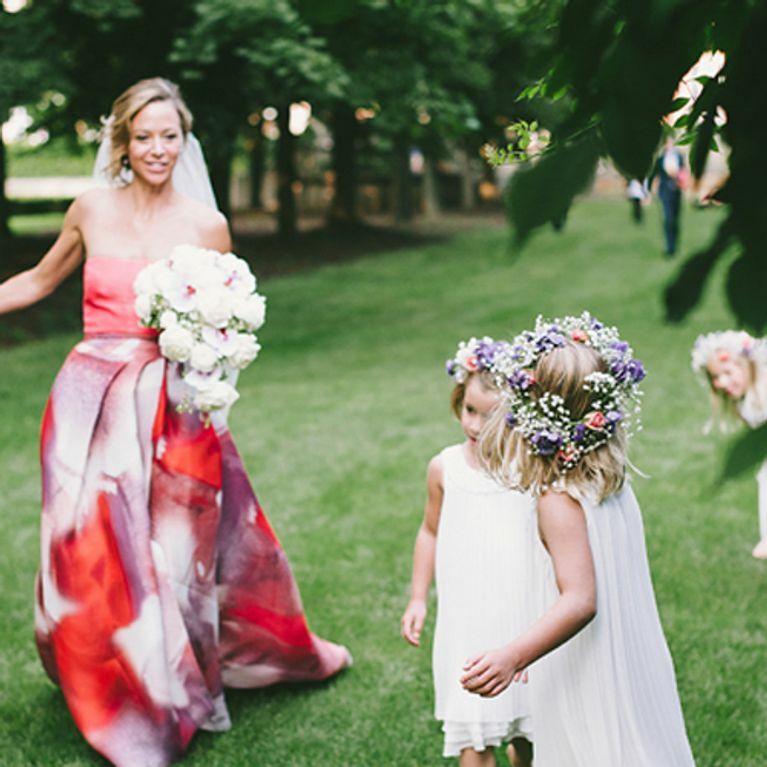 There's something so stunning and fun about a bride wearing prints on her wedding day. It's fun, it's different and it shows the bride's personality. Black dresses are the ultimate "up yours" to the white wedding dress tradition. And rather than being a goth statement, black dresses can be very glam and elegant, and works perfectly for cocktail weddings.